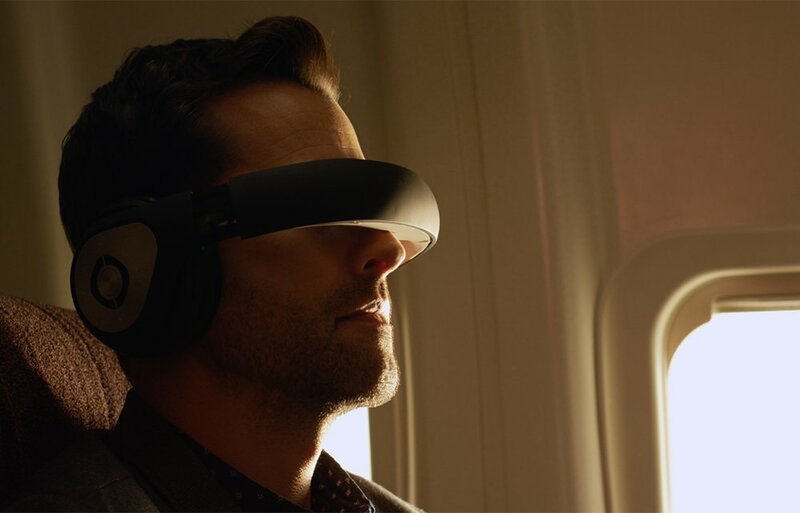 Inflight entertainment is dead, but the bring-your-own-device revolution has only just begun – and the Avegant Glyph could be the weapon of the future. They look like a pair of headphones, but orient them across your face and your eyes are sent an LED projection. Cue movies, and even 360-degree VR-style footage, while you’re pulling the long haul. A mobile home cinema at 35,000ft? What’s not to like? Will you look like an idiot? Er, well, yes you will, but that’s not bothered frequent flyers before. Most of them wear pyjamas in the airport. So what’s the Avegant Glyph all about? Sending 1280×720 pixels to each eye – that’s HD, but not much more – it’s got a widescreen panel and a 40-degree field of view. Immersive virtual reality this is not; the Avegant Glyph is all about watching standard movies. Sure, you can watch 360-degree footage, but don’t expect a wraparound experience (not that you’d want than on a plane). However, like using a pair of binoculars, wearers can remove their glasses. You use an HDMI cable. Yeah, strange, isn’t it? Although it can take video from a host of devices – from smartphones and games consoles to Apple TV, Roku and Amazon Fire TV – you need an adaptor cable to make it happen. When you’ve just paid this month for a device, you don’t expect that. So we had to abandon the idea of testing the Glyph with an iPhone, and instead used a Blu-ray player, which wasn’t nearly as convenient. In terms of judging the video quality it worked just as well, but it did make us think that the Glyph needs a built-in HDD to store a few movies. You do get to see a slice of reality both above and below the scree, in your peripheral vision, so that’s handy for staying aware of what’s going on in the plane. While you can link the Glyph to your phone via Bluetooth and use them just for audio, the real treat is when you orient them across your face for video. A few adjustments are needed; focus, nose-pad placement, and optical alignment, but in our tests with a Blu-ray disc the video was great quality, reasonably sharp and only a tad too bright. Audio was good, too – the Glyph give some awesome sound. There are few buttons on the side that acts as touch-controls, including one to activate 3D head-tracking mode and another to activate 3D mode. Both work reasonably well, though head-tracking suffers rom a very limited field of view. Wraparound VR this is not! However, the major drawback is that the Avegant Glyph only lasts for four hours. It’s also rather large in its carry-on case, and weighs just shy of 800g. At home on the plane? Impressive, but too reliant on messy cables, the Glyph seems more at home in the home than on a plane. That’s a shame, but it’s a feeling that’s reinforced by a short battery life; if the makers up the battery to six hours, add a small HDD that can store 10GB of movies, and include adaptors for leading iPhones and Android phones (and tablets), it could be game on for the Glyph. However, for now this otherwise polished version isn’t versatile or long-lasting enough to make it into our carry-on bag.